First Secretary of State, the Rt Hon William Hague MP praised Britain’s universities as “one of our nation’s most distinctive contributions to the world” as he officially opened the university’s new Stockwell Street building on Tuesday 9 December. 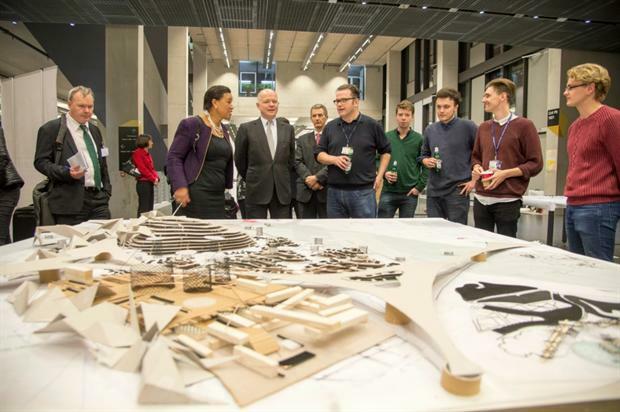 The former Secretary of State for Foreign Affairs toured the building’s facilities, discussing the 24-Hour East of Eden project with Nic Clear, Head of Department Architecture and Landscape, before delivering a speech addressing the importance of universities as champions of British values, such as intellectual enquiry, high academic standards and civic engagement, both domestically and overseas. He said: “It is an honour to join in opening this spectacular new building, which sends an extremely strong message about the future of the University of Greenwich, and of Greenwich itself. Vice-Chancellor, Professor David Maguire, added: “I am delighted at the excitement our new building has generated. It serves to remind all of us what can be achieved when you aim high. We expect a great deal from our students and, quite rightly, they expect a great deal from us. This building will allow the university to advance our excellent research in smart buildings, environmental sustainability and creative arts. Other speakers included the university’s Chancellor, Baroness Scotland, and former Vice-Chancellor, Baroness Blackstone. The Tessa Blackstone Lecture Theatre, the largest in the new building, has been named in her honour. Rapolas Vilunas, a student from the Faculty of Architecture & Humanities who is based in Stockwell Street, explained how it had transformed his experience of learning. The £80 million building is home to the university’s main research and study library, as well as the Department of Architecture & Landscape and the Department of Creative Professions & Digital Arts.